With the passing of Labor Day, we’re out of the summer show season and into the fall theatre season. This brings the season openers for many companies, including the Ahmanson Theatre (FB). The Ahmanson’s first show is an odd beast: it was essentially a replacement for Crazy for You, announced for February 2018 but later postponed. This meant that it was an addition to the previous season as well as being (due to timing) the first show in the 2018-2019 season. This made me glad I hadn’t gotten tickets to Crazy for You, because we ended up subscribing. This also meant that there was essentially double the audience fighting for seats, so that when we changed our seats due to our vacation, we ended up in the far back row (row Z; our subscription is Row S). This is also a biographic jukebox musical, along the lines of Jersey Boys. However, the songs generally don’t serve to tell the story, but to tell the time — presented chronologically where they are in the storyline, as opposed to being used to provide the story line. Lastly, this is also a pre-Broadway musical. It has been announced for the Imperial Theatre, although the cast or opening date is still pending. The Los Angeles production is the 3rd developmental production; there is still one to go in Toronto. Hence, when looking at this musical, we’re not just judging it as a replacement show for a revision of an (essentially) George Gershwin jukebox (for that, really, is what Crazy for You is). It is a new musical, and it needs to meet the standards of Broadway. Does this production, which features a book by Dominique Morisseau (FB), based on the book The Temptations by Otis Williams (FB) with Patricia Romanowski, music and lyrics from “The Legendary Motown Catalog”, and direction by Des McAnuff, meet those standards? No. In many ways, it reminds me of Baby, It’s You that we saw at the Pasadena Playhouse many many years ago … and which went to Broadway and quickly disappeared. That doesn’t mean it can’t be fixed, but in its present form, it will have problems. Luckily, these problems are primarily book-based (a major problems for shows). The Motown music catalog is always a delight, although with the recent Motown and shows like Dreamgirls, it may be a well that has been drawn from too frequently. As just noted, the story is based on the book written by the one constant member of the Temptations, Otis Williams. As such, it does tend to present his view of the story; given the various infighting over the years, one would expect some differing views might have emerged — but they are never presented. Reading through the Wikipedia history, the version on stage seems to capture the highlights, although it glosses over many of the numerous changes and problems over the years. All for entertainment sake, I guess. In terms of all the personnel changes and the fighting over the group’s name, it reminds me of all the changes in groups like The Kingston Trio or the Limeliters over the years. I guess folk and R&B are connected. In terms of how accurate the music was, I must confess to not having even a shallow Temptations catalog — out of the 45,000+ songs on my iPod, only 5 are from the Temptations — and 3 of those are from the Motown musical. The main book problem with the show is that it is very narrative driven. The scenes in the show often don’t tell the story — they are performances. What tells the story is the narrator. That’s wrong for a musical. In a musical, either the scenes or (ideally) the music should tell the story. That it doesn’t here is a problem that book writers need to address before this arrives on the Great White Way. But that’s structural, and structure is often different than entertainment. This show is entertaining, no question. The music is a collection of Motown hits — and not just from the Temptations, but from other Motown groups such as the Supremes. There is the remarkable dance and choreography of the Temptations, recreated by the choreographer Sergio Trujillo. There is the remarkable on-stage but hidden band under the direction of Kenny Seymour. When they rock out at the end of the show, you are just blown away. As a concert and dance performance with a Cliff Notes story, this is just great. The performances — especially the singing and dancing performances — are exceptional. The main problem is that with so many changes in the composition of The Temptations, many of the later members become indistinguishable, especially if you are seated at a distance. This is complicated by the reuse of the ensemble in multiple roles — making it difficult to tell who is who. Luckily, that’s less of an issue for the top tier — the main Temptations: Derrick Baskin (FB) [Otis Williams], James Harkness (★FB, FB) [Paul Williams]; Jawan M. Jackson (★FB, FB) [Melvin Franklin]; Jeremy Pope (★FB, FB) [Eddie Kendricks]; and Ephraim Sykes (★FB, FB) [David Ruffin]. They are unmistakable, especially Jackson’s deep voice. A few others have primary named roles and a few background unnamed ensemble tracks: Saint Aubyn (FB) [Dennis Edwards, Fight Captain, Ensemble]; Shawn Bowers (FB) [Lamont, Asst. Dance Captain, Ensemble]; E. Clayton Cornelious (★FB) [Richard Street, Ensemble]; Jahi Kearse (FB) [Barry Gordy, Ensemble]; Joshua Morgan (★FB, FB) [Shelly Berger, Ensemble]; Rashidra Scott (★FB, FB) [Josephine, Ensemble]; Christian Thompson (★FB) [Smokey Robinson, Ensemble]; and Candice Marie Woods (FB) [Diana Ross, Ensemble]; Note that Morgan is the easiest ensemble member to identify; he’s the only white guy in the cast. As for the rest, the multiple casting makes them hard to tell apart: Taylor Symone Jackson (FB) [Johnnie Mae, Mary Wilson, Ensemble]; Jarvins B. Manning Jr. (★FB, FB) [Al Bryant, Norman Whitfield, Ensemble]; and Nasia Thomas (FB) [Mama Rose, Florence Ballard, Tammi Terrell, Ensemble]. Swings were Esther Antoine [Dance Captain]; Rodney Earl Jackson Jr. (FB); and Curtis Wiley (★FB). As I said before, the orchestra was strong, under the direction of Kenny Seymour [Keyboard1]. The other members were: Sean Kana (FB) [Assoc Conductor, Keyboard2]; Sal Lozano [Reed]; Dan Fornero (FB) [Trumpet, Flugelhorn]; Robert Payne [Trombone, Contractor]; Keith Robinson [Guitar]; George Farmer (FB) [Bass]; Clayton Craddock [Drums]; Mark Cargill and Lesa Terry [Violins]; and Lance Lee (FB) and Joey de Leon [Percussion]. Other music positions were: John Miller [Music Coordinator]; Steven M. Alper [Music Preparation]; Randy Cohen (FB) [Keyboard Programmer]; Tim Crook [Assoc Keyboard Programmer]. Orchestrations were by Harold Wheeler. Music was by arrangement with Sony/ATV Music Publishing. Finally, turning to the production and creative side. The scenic design by Robert Brill was tightly integrated with the lighting design of Howell Binkley and the projection design of Peter Nigrini. It made heavy use of projections and LEDs, and was at times very busy without the traditional scenic elements. It was, perhaps, a little too busy for my tastes, but generally worked. The sound design of Steve Canyon Kennedy was clear in the back of the theatre. The costumes of Paul Tazewell worked well, as did the hair and wig designs of Charles G. LaPointe. Rounding out the production team: Steve Rankin [Fight Director]; Edgar Godineaux [Assoc Choreographer]; Molly Meg Legal [Production Stage Manager]; Tara Rubin Casting [Casting]. Most of the other credits are management, but two are of note: Shelly Berger, who was the original Temptations manager, was the creative consultant, and Otis Williams, the last remaining original Temptation, was an Executive Producer. AIn’t Too Proud continues at the Ahmanson Theatre (FB) through September 30. It was quite entertaining, even if it needs some work. Tickets are available through the Ahmanson Box Office. Discount tickets may be available through Goldstar. Today will bring Paradise – A Divine Bluegrass Musical Comedy at the Ruskin Theatre (FB) on Saturday. The fourth weekend of September has Rope at Actors Co-op (FB), and the fifth brings Bark: The Musical at Theatre Palisades (FB). October is also getting quite full. It starts with Oppenheimer at Rogue Machine Theatre (FB). The following weekend brings Moon River -The Music of Henry Mancini at the Saroya [the venue formerly known as the Valley Performing Arts Center (VPAC)] (FB). The third weekend of October brings Shrek at 5 Star Theatricals (FB). October will close with the Contemporary Crafts Show in Pasadena. A few weeks ago, we were on vacation up in Lake Tahoe. We never let a vacation stop us from our interests, and one of those interests is good theatre. So I always check the listings and see what is in the area. In this case, we were able to catch the last performance of Macbeth at the Lake Tahoe Shakespeare Festival (FB). Summer is the time for outdoor Shakespeare, and we do enjoy hitting at least one show during the summer, so this fit well. The venue itself was beautiful; I snapped the picture to the right from our original seats at the show. There are two seeing areas: formal seating on dirt rows, and less expensive seating at the top and the sides with chairs set in sand. We were in the latter. Our location is significant because this, after all, is the Scottish Play. The curse of the play hit us before the show, while we were sitting in our seats eating the dinner we had brought. My wife took a bit of her sandwich … and got a hornet, which stung her tongue and cheek. She was worried about an allergic reaction (as was I), and I had visions of trying to get her out through the sand … whereas she was worried about a helicopter evacuation. Luckily, one of the volunteers was an RN and had Benedryl with her. This was able to damp down the reaction; they also moved us much closer to the front to the handicapped seats so they could observe her and make it easier to get out in the dark. In any case, the incident unnerved us — and let me to put off doing this writeup until I bumped into having to write up another show. We had another show last night. One other note on the venue. In the tickets, they advise you that it gets cold in the evening. Believe them. Even though it was hot when we arrived, as the sun went down the altitude and thinner air led it to cool off very quickly. We were glad we had brought jackets and a blanket. So, Macbeth, by William Shakespeare. Quite likely, you are familiar with the story of The Scottish King, who uses murder to achieve his position. A King who goes mad and kills his rivals. A king that sees conspiracies everywhere. A play with that famous line: “That struts and frets his hour upon the stage, / And then is heard no more. It is a tale / Told by an idiot, full of sound and fury, / Signifying nothing.”. I shant summarize the story as you can find it on Wikipedia. What struck me, watching the play, was an echoing similarity to the Presidency of Donald Trump. A man who wants power. A man who wants adoration. A man who will seemingly do anything to keep that power. A man who tells a tale of sound and fury, but ultimately signifies nothing. I encourage those familiar with the story to review it and see if they agree. This production, which was directed by Charles Fee, was magnificent. With Shakespeare, I find that the dated language and style make it harder to get into the story at the start, but once I got into it, this presentation gripped me. There was no attempt to modernize or change the setting of the story: this was traditional Shakespeare, told in a traditional fashion. I’ll note there were a few understudy substitutions that — due to my wife’s hornet sting — I didn’t note down. There was also one player performing with what appeared to be a strained or broken ankle in a cast or boot. Live theatre, folks. The show must go on, even a cursed one. As I’m writing this three+ weeks post show, it is a bit harder to remember the tiers of performances. But some stand out even through the mists of times. As the Scottish Prince, the thane of Glamis, Lynn Robert Berg (FB) was spectacular. I still remember the anger and evil that radiated from him, and the power of personality that held people in his thrall. Very, well, Trump-ish. Erin Partin (FB), was not like Melanie. She portrayed the Scottish lady as the Prince’s equal in evil, someone equal in plotting, but who was literally driven mad by it. Also strong were the three weird sisters, Sara J. Griffin (FB), Meredith Lark (FB), and Jessie Cope Miller (FB). They had a movement and style that made their performance just great .. and somewhat unworldly. Just a joy to watch. Also sticking out in my mind for their performances (but the specifics are lost) were David Anthony Smith (FB)’s King Duncan; Jonathan Dryud (FB)’s Banquo, and Christopher Tocco (FB)’s Macduff. Rounding out the cast (and other roles) were: Lavour Addison (FB) [Ross]; Joe Atack (FB) [Lennox]; Peder Benson Bate (FB) [Sergeant, Murderer, Ensemble]; Remell Bowens Jr. (FB) [Nobleman, Ensemble]; Aled Davies [Seyton]; Sara J. Griffin (FB) [Weird Sister, Lady Macduff]; Jeffrey C. Hawkins (FB) [Malcolm]; Meredith Lark (FB) [Weird Sister, Gentlewoman/Lady Macbeth’s Attendant]; Jessie Cope Miller (FB) [Weird Sister]; Andrew Pope (FB) [Nobleman, Ensemble]; Peter Ribar (FB) [Donalbain, Ensemble]; David Anthony Smith (FB) [Duncan, Siward]; Mark Anthony (M.A.) Taylor (FB) [Murderer, Ensemble]; Daniel Telford (FB) [Young Siward, Ensemble]; and Colin Unruh [Maduff’s son, Fieance]. Understudies included the ensemble members and non-lead players, as well as Brittni Shambaugh Addison (FB), Briana Biller (FB), Adriano Cabral (FB), and Gregory J. Klino (FB) (whom I’m guessing also served as swings). Turning to the production side: The scenic design by Russell Metheny was simple and Shakespearean, and appeared to make great use of the LTSF facility. Costumes by Kim Krumm Sorenson seemed appropriately period. The lighting design by Rick Martin I recall as being sufficient, but I think there was the occasional actor in the dark. The sound design by Matthew Webb was good during the show, but the sound used for the pre-show announcements was much weaker. Rounding out the credits were: Ken Merckx [Fight Choreography]; David Anthony Smith (FB) [Text and Speech Coach]; Casey Hagwood (FB) [Stage Manager]; Sarah Kelso (FB) [Asst. Stage Manager]; Jonathan Dryud (FB) [Fight Captain]. 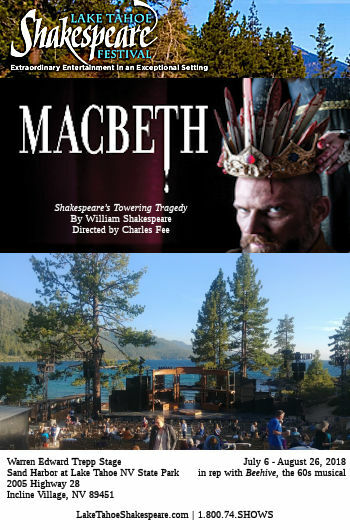 Macbeth was a co-production of the Lake Tahoe Shakespeare Festival (FB), the Idaho Shakespeare Festival (FB), and the Great Lakes Theatre (FB). We caught the last summer performance of the LTSF and Macbeth at Sand Harbor. Were we back in the area, we’d look at future productions. This weekend brings Ain’t Too Proud at the Ahmanson Theatre (FB) on Friday, followed by Paradise – A Divine Bluegrass Musical Comedy at the Ruskin Theatre (FB) on Saturday. The fourth weekend has Rope at Actors Co-op (FB), and the fifth brings Bark: The Musical at Theatre Palisades (FB). October is also getting quite full. It starts with Oppenheimer at Rogue Machine Theatre (FB). The following weekend brings Moon River -The Music of Henry Mancini at the Saroya [the venue formerly known as the Valley Performing Arts Center (VPAC)] (FB). The third weekend of October brings Shrek at 5 Star Theatricals (FB). October will close with the Contemporary Crafts Show in Pasadena.